If you have never crocheted before or like learning at a slower pace then these classes are for you. Learn the four basic stitches (chain, slip stitch, single, double) while creating a flower in the first class and starting a scarf in the second. We will also cover basic pattern reading. If you have crocheted before and would like to re-acquaint yourself with this craft, then this fast paced class is for you. We will review foundation and turning chains and single, half double and double crochet stitches. You will start a dish cloth in class. Have you seen those fun graphghans on Pinterest and Ravelry and wondered how they did that? 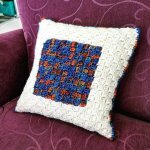 Easily master corner-to-corner (C2C) crochet when you make this pillow! The square design helps you learn the basic technique as well as color changes. Soon you?ll be making your own graphghans, or anything you want a graphic on! If you have never knitted before then this class is for you. Learn the basics; how to cast on, knit and purl stitch and how to cast off. This fast-paced class is better suited to those who are re-acquainting themselves with the craft of knitting. In two hours you will review casting on, the knit stitch and casting off. Get supply and homework information from Studio before you come to class. This class meets 6 times: January 14, 21 & 28 and February 11, 18 & 25. 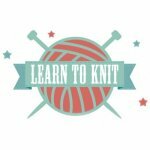 This is a great class for those who like to try out new projects but prefer to have an experienced knitter to help them through the tough spots. Bring your own project, pattern, yarn and supplies. Dates: April 29-May 16 Cast on: Monday, April 29, 5-7 pm Wrap up (in your new shawl) and photos: Thursday, May 16, 6:30-7:30 pm ﻿Moderators: Cindy Craig, Lynn Haffner, Jessica Kerrigan, and Monta Morris Experience level: Advanced beginner and beyond! Cost: $50 plus materials We'll get you started on your race at the cast-on party and celebrate crossing the finish line in a new shawl at the wrap up celebration. In between we will host several weekend and evening KAL sessions, and you can always get help at The Studio during normal business hours. Participants will receive a project bag with notions, helpful information, and goodies. Prize drawings will be held at the end of the KAL, and we'll take photos. Learn the incredible Emily Ocker circular cast-on (no seaming required!) and say goodbye to those plastic bags at the grocery store and farmers? market. Other improvements on the original pattern include larger handles and a larger opening. Yes, it is true, resourceful knitters can help change the world. This class meets 6 times on Tuesdays, 2-4 pm on January 15, 22 & 29 and February 12, 19 & 26. It is time to get out those trouble-some projects at the bottom of your bag and get them finished! Wherever you were stuck, there will be an experienced knitter on hand who can help you take it on. If you have never knitted socks before, then this class is for you. You will learn all the skills necessary to make a great pair of socks from the cuff down using double pointed needles; including stretchy cast-on, ribbing, turning the heel, gussets and closing the toe. And when you are done, you will have opened a whole new world of sock knitting! Ravelry is an amazing resource for knitters and crocheters. Get a guided tour of some of the most useful features. In this free session we?ll focus on finding the perfect pattern for your yarn (and vice versa). We?ll also look at how to find out more about a pattern before you commit to buying it. Bring your laptop or tablet. Registration is limited to 8 so register NOW if you want to come. This pretty short sleeved sweater by Caitlin Hunter is perfect for summer. Tegna is knitted seamlessly from the bottom up, starting with the slightly flared lace hem, then is worked up to the armholes, separated and then knit flat. The top is intended to be slightly cropped, but can easily be made longer - directions included. Lace directions are both charted and written. Become a more confident knitter by learning to read your knitting. Learn how to fix these common mistakes: dropped stitch, twisted stitch, added stitch, holes in knitting and how to change a knit to a purl and vice versa. Learn tips on using a lifeline, ripping out rows and how to unknit (tink) stitches. This top-down circular yoke sweater features stranded colorwork?which could be enticing to those of you who participated in the recent KAL. The design can easily be lengthened if crops aren?t your style; instructions are included in the pattern. Its short sleeves make it perfect for layering for our very variable mid-western weather. Best of all, the cropped length and capped sleeve style make this a super quick and gratifying project. This multi-directional diagonal scarf is a great first project for beginning knitters. You have learned the knit and purl stitches; now discover how you can to use these stitches and build on them to create a unique scarf that will have people asking, ?How did you do that?? Begin your journey into the needlepoint world. You can purchase an easy hand-painted canvas from the many needlepoint canvasses or an choose to make a bookmark on a Studio prepared canvas. You will learn the basket weave stitch and other useful tips and techniques. Leave class with the skills you need to tackle your next NP project. PLEASE NOTE: The canvas you select must be 13 count mesh. Studio staff can help you in your selection of a canvas and thread(s).